Human nature works against our faith. It always has. At least since the fall of Adam. We are searching for answers that are comforting to us as humans. We continually question all truth. We challenge the authority of the Bible and then we doubt. When it comes to strengthening our faith, we want to be reassured, soothed, comforted and restored. We want to be told that we are good people; that we are loving individuals with a heart full of compassion and a life full of good deeds. We longingly want someone to tell us the unknowns, to lead us out of the shadows of doubt and into the light of true belief. We search for truth, but is it in all the right places? Do we really dare to know the answers? Can we handle the truth? So, again, what is the Word? The Word is Jesus Christ and He came to reveal to us the truth. He truly doesn’t have a clue! He thinks it is relative, because he is searching for it within the world. (Kinda sounds like a lot of people today, doesn’t it?) Wrong place! If you are not on the side of truth, then you cannot understand, because you are on the side of the great deceiver. Anyone who says that truth is relative and that it depends upon your point of view, may want to consider which side they are representing. They can consider this position now while there is still time to repent and turn to the Lord, or wait until Judgement Day, when they will be shown the truth by our Lord and Savior. Of course by then it will be too late to save their own soul. So given this need for renewal and strengthening of faith, where do you suppose one should go? Unfortunately we typically make the same mistake as Pontius Pilate. We look to the world and take comfort in what humans have to say. I’m not saying this is bad. In fact, that is probably why you are reading this right now. This can be fine to begin your search, but it is not the final destination. Use it simply to get your wheels moving in the right direction. Not as a permanent solution. “Why not?” you may ask. Well, let me pose this question to you. What if your human source got it wrong, or perhaps, not quite right? Or, what if that human got it perfectly right but then, through human plight, was caught in a sin? You notice I said “caught?” I say that because, as humans, we all sin. Oh yeah. Me. You. Everyone! No exceptions! Well, almost no exceptions. The only righteous one was Jesus, and of course, we know what happened to Him. He was nailed to a cross by us sinners. He was persecuted by us humans, because He was the Son of God. I think it is pretty clear why we need to build our faith upon something more solid than the human word. Let me give you a contemporary example. What if all of your faith was tied to the word of a gifted human being? One who appeared to the outside world to be nearly faultless. Dare we say perfect? Perhaps it could be a spouse, a great friend, a prominent citizen, a charismatic leader, an inspirational speaker, or even the head of a flourishing and powerful congregation. What could possibly be wrong with that? I’ll tell you the truth my friend. When that person is caught in sin, the devil will use that opportunity to attack your pursuit of faith. If the sin is small, you may only lose a little of your desire for the knowledge of truth. If that sin is stunning, you may lose it all and question everything. Do not tie your pursuit of faith to another human vessel. If it goes down, you could be pulled down with it and lose everything. I have personally witnessed cases where pride, i.e. egos, have broken up churches and even turned some members of the congregation away from the Lord. 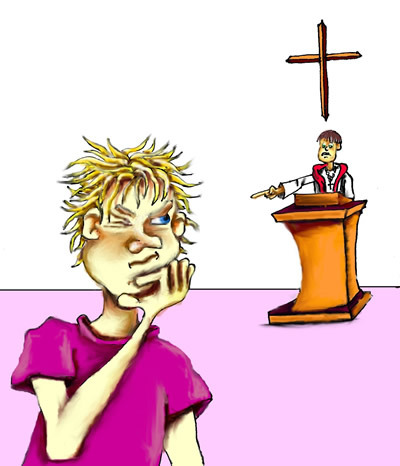 This actually happened in a church that I attended many years ago. The congregation split and many left the church in bitterness; perhaps for good. Many times the great deceiver will attack the good intentions of church leaders and if an opening is presented, he will pull down the best of us through the deception that comes with pride. That is why the Word of God is needed by everyone, every way, everywhere everyday. There are no exceptions. As a side note, I’m not advocating staying away from church. On the contrary, that is a place where we need to go for worship, comfort, witnessing and learning the Word. But in the end, we must put our faith in the Word of GOD, not in the human word. Perhaps you’re still not convinced? Let me try another question. What if I were to ask you for all of your money, the title to your house and all of your treasures, including your retirement nest egg? Would you give it to me? Now let’s assume that I’m serious and that I’m actually asking you this question without the use of a weapon. My promise to you would be that whenever you needed anything, I would be there to take care of your every need. Trust me, I’ll be there. (Sounds kind of like the government, huh?) But before I make that commitment, you must first title everything that you own to me. Would you give it to me without question? Would you trust me with everything you own? I think not. I certainly hope not! I have enough trouble keeping track of my own money. 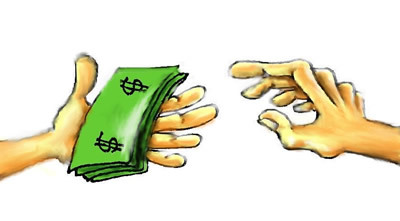 So if not your money, then why your soul? Do you hear what I’m saying? Your soul! It is the most precious possession you will ever be entrusted with. If you have salvation of your soul, you will have an eternity of time. They say that time is money. If that is so, then wouldn’t you want an eternity of it? So put your focus on where the eternity is. Focus on the truth. Okay, so where is that exactly? The answer can be found in the heart of your Bible. Psalm 118 is the absolute center chapter of the Bible. If you don’t believe me, count them. There are 594 chapters before Psalm 118. There are 594 chapters after Psalm 118. Add all these chapters together (594 plus 594) and you get 1,188 chapters. Want to guess on which verse is the very center of the Bible? Remembering that our God loves numbers, it is only fitting that the center verse of the Bible is 118:8. (Coincidence?) And what does it say? Could our Lord be any more obvious? So ask yourself. Is our LORD the center of your life or is it the word of man? (Or woman, to be politically correct.) The only answer to a rock-solid faith has been there all along. It is in the Word of God; our beloved Bible. It is the most published book the world has ever seen. 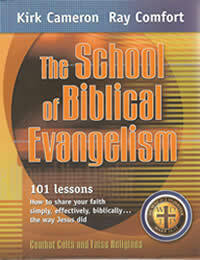 This book has been translated into over 1,400 languages and is available worldwide. The number of Bibles sold are in the billions. Not millions, but billions. There are DVD’s, VCR tapes, movies, guides, and guides to study the guides. 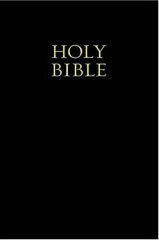 Never in the history of our world has so much information been available at our fingertips to know and understand the greatest book of all. Yes, I’m talking about the Bible. Let me ask you a question. Do you suppose that we have always had so much knowledge of the Bible at our fingertips? So with all of this material available, how familiar are you with the Bible? (Gut check time.) How seriously do you seek out the truth? Remember, prior to the invention of the printing press in 1450, all Bibles had to be copied by hand and it took years to expertly produce a perfect copy. Common people could not get their hands on a Bible. It was beyond their wildest dreams. Even if they could get a copy, it would have been in Latin or Greek, which would have stumped almost everyone from reaping its mighty rewards. (I have enough trouble understanding the Bible in English, I couldn’t imagine trying to read it in Latin or Greek.) When the printing press was finally rolled out, guess which book was the first one printed on this new invention? Surprise, surprise, it was the Bible. If it wasn’t for the printing press, Martin Luther’s work from 1517-1546 would probably have been unsuccessful. (God’s timing is perfect.) Martin Luther actually had the audacity to advocate the removal of mankind’s layer of human righteousness between the sinner and salvation. In other words, salvation could not be purchased or sold by mankind. Our approval is not in the equation. We cannot take credit for it, and we can not slice off a commission from it. It could only be purchased through the blood of Christ. It was a gift from God through Jesus Christ, His Son (Ephesians 2:8,9; 1 John 1:7 and Romans 6:23). Martin Luther insisted that everyone should have access to a Bible and that it should be in the language of the host country. He knew how important it was to remove the layer of corruption from mankind, so that the common people could actually read and understand the good news of Christ on a personal basis. He wanted everyone to know that salvation could not be purchased through the sale of indulgences. This seems like a no-brainer in today’s world, however many Godly men and women were burned at the stake for advocating such a position. On June 15, 1520, Pope Leo X issued a decree that gave Luther 60 days to recant his positions. The church wanted desperately to have Luther executed for his beliefs. (Can you imagine how much we take for granted in today’s world?) I believe that it was only by the hand of God that Luther was protected from the Pope and the angry Roman Catholic Church. During that time frame, many hundreds of thousands were forced to give up their lives for believing in salvation strictly through faith in Christ. Let me share just one of the documented martyrs from the 16th century in which I am speaking of. This story comes from Foxe’s Book of Martyrs by John Foxe, rewritten and updated by Harold J. Chadwick. This setting takes place in 1553 in the city of Winchester, England. The ruler of England was Queen Mary and her husband Philip II, the son of Holy Roman Emperor Charles V. Queen Mary wasted no time earning her nickname “Bloody Mary” for her persecution and burning of about 300 Protestants for their religious beliefs. (Think about that the next time you see someone order a Bloody Mary to brighten their mood.) Of all these stories, too numerous to tell here, I’ll give you a brief look into John Hooper, who happened to be the bishop of Worchester. Seems like a pretty safe position to be in. However, nobody was safe if you had the ire of Queen Mary. He was quickly jailed on a false charge of owing the Queen money. He then spent time in prison for being married and for not acknowledging the Pope’s interpretation of the sacrament. He spent 18 months in a prison which featured open sewers and an unbearable stench. He was chained in a cell and was many times near death. For this he had the privilege of paying 20 shillings a week for his board. His response was “I commit my cause to God, whose will be done, whether it be by life or death.” (Foxe, 166) In that statement, he wasn’t falsely boasting. “When he finished praying, he went to the stake and took off his host’s gown and gave it to the sheriffs, asking them to give it back to the owner... The guard gave him three sacks of a pound each of gunpowder, [this made the fire at the stack burn more quickly and intensely] and Hooper took back one of his stockings and tied his shirt between his legs to hold one of the sacks, and held the other two in his armpits. When the fire from the dried faggots started to die out without igniting the green faggots, Hooper wiped his eyes with his hands and said, with an indifferent loud voice, ‘For God’s love, good people, let me have more fire!’ All this time the lower part of his body was burning, for there were so few dried faggots that the fire did not burn strongly enough to reach his upper body. After awhile, more dried faggots were brought and a third fire kindled that was stronger than the other two. This fire broke the sacks of gunpowder but they did him little good, neither exploding nor increasing his burning because of the strength of the wind that blew the fire away from him. During this slow burning, Hooper prayed in a somewhat loud voice, ‘Lord Jesus, have mercy upon me. Lord Jesus, have mercy upon me. Lord Jesus, receive my spirit.’ These were the last words he was heard to speak. But even when his mouth was black and his tongue swollen, his lips could still be seen moving in prayer until they shrunk back into his gums. During these moments, Hooper struck repeatedly at his chest, or heart, with his hands until one of his arms fell off, and then continued striking his chest with the other hand while fat, water, and blood spurted out his fingertips. When the flames suddenly flared up in great power, Hooper struck his chest only once more as his strength gave out and his hand stuck to the iron band around his chest. At the same moment, his body fell forward against the band and he gave up his spirit. You are probably reacting the same way that I did the first time I read this recounting of the incident; you are probably sick to your stomach. You may be angry at me for exposing you to this painful story, but one needs to know the truth in order to face the evil one and be freed from deception. Our salvation did not come lightly! Since the time of Christ, millions have given their lives for the spreading of the truth. Yet in today’s society we have watered it down and allowed Satan to deceive us into thinking that truth is relative depending on your personal experience. Many churches in America even preach that Christ did not literally rise! Am I overreacting? Why would there be a movement in the world to change the accepted terminology used for marking history from BC, Before Christ, to BCE, Before Common Era. Let me ask you a simple question. Has anyone ever come along in all of the ages since Christ, to so impact the world that we needed to place a new marker in history to separate time into components of before that individual and then after that individual? I think not. Yet, the one whom we were forced to acknowledge, by placing a marker in recorded history to account for this phenomenon, is now being written out of His place in history. Only in the eyes of man does this make sense. So why are the New Age people so concerned about removing Christ as the marker? The answer is simple. They want to deceive you, me and the next generation about history (His Story). They don’t want you to know the truth. Some even claim that truth is simply intolerant. That it is too judgmental. Some try to convince you that the Bible is just a collection of stories. Perhaps it is a document that should not be taken literally. What really makes me sick to my stomach is when I hear preachers tell me that Jesus is going to make me successful and rich and fulfill my every worldly desire. Try telling that to the millions of glorious martyrs who took their last breath defending the Bible against the evils of the world. The Bible is the Word of God my friends. It is the only Word that we can live by. It is the Word that we should be willing to die for. We must stand up and be counted. The martyrs did not compromise and sell out. (Did you notice that the Christian martyrs unflinchingly gave their lives for Christ, so that their fellow mankind may live and learn the truth? Can you think of any religion where fanatical martyrs are taking the opposite approach?) The next time you see that dusty, old, unused Bible lying on the bookshelves, remember how many Christian martyrs died so that you may have personal knowledge of your salvation through Jesus Christ. 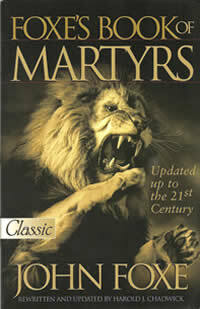 Please get Foxe’s Book of Martyrs and read it for yourself. It is a bone chilling revelation about truth. As you can plainly see, we cannot be lazy in matters of such importance. You must commit to study the Word of God. Only then can you anchor your faith in the true knowledge of life everlasting. I know that it is hard at first. The Bible seemed like it was written in Greek when I first read it (okay, so half of it was, but I did have an English translation). It took me years to truly accept the Holy Spirit into my life and that is when the Bible started making sense and the scripture began to leap off the pages. Once you come to know Christ through the Holy Word, you will be able to walk this earth knowing where you are and where you will be for all of time. You will literally be able to walk through fire for Christ. You can do this knowing that your time on earth is limited, but your future in heaven is assured. That’s an eternity my friend. Have faith. No one can ever take that away from you, because it was given by God. There is none other. There is none like Him. We must seek Him, where He is and always has been. In the Word. In the beginning was the Word, the Word was with God, and the Word was God. Come, let’s go seek Him together.